When offered the opportunity to adapt an exclusive recipe from Donna Currie’s new cookbook Make Ahead Bread, I wanted to honor Donna’s original, yet create something different enough to expand its versatility on a menu. The compound butter recipe appealed to me because I felt I could turn it into something that could work in a savory application as well as a sweet one. The warmth of Chinese five spice powder lends itself to both sweet and savory dishes, and is the cornerstone of many Chinese dishes. Pork and apples is a natural pairing, so what better dish to bridge this butter but Chinese Char Siu? The idea of a fruity, melted butter also conjured up images of breakfast, so why not create a new breakfast pairing? Move over, Chicken and Waffles, here comes Char Siu and Waffles, with pork reclaiming its rightful place on the breakfast (or dinner) table! Donna’s Potato Pancake Waffles recipe is sheer genius, with a simple puree of potatoes, onions and egg. I added scallions to boost the Asian theme, but the possibilities for adapting this recipe are truly endless. This recipe was fun to put together, but I invite you to try each element on its own, adding your own spin. 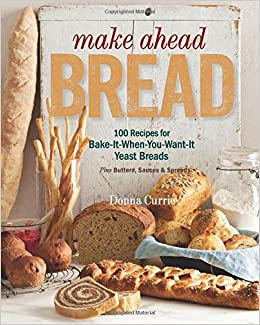 Please check out Donna Currie’s cookbook, available now: Make Ahead Bread: 100 Recipes for Melt-in-Your-Mouth Fresh Bread Every Day, and her blog, Cookistry. Melt 1 tablespoon of butter in a sauté pan over medium heat. Add the apple and five spice powder and cook, stirring occasionally, until the apples are cooked through and soft, about 10 minutes. Remove apples from the pan, spread out in a shallow dish, and allow to cool completely. Place the stick of butter in a food processor fitted with the metal blade and process until smooth (or use a hand-held mixer in a medium bowl). Add the cooled apples, white pepper, salt, and cream cheese. Blend until combined. Taste for seasoning and add more salt, if desired. If the apples are too chunky, continue processing until it reaches desired consistency. Form into a log, wrap in plastic, and refrigerate for at least one hour or overnight. Thirty minutes before serving, slice serving portions into 1/2” coins. Place on a plate and bring to room temperature. Place pork in a shallow dish. Sprinkle with salt and white pepper. In a shallow bowl, whisk together wine, sesame oil, soy sauce, 2 Tablespoons hoisin sauce, 1 Tablespoon honey or agave nectar, sambal oelek, five spice powder, ginger, and garlic. Pour over pork. Turn to coat evenly. Cover and refrigerate at least two hours or overnight. Preheat oven to 375°F. Prepare broiling pan by lining bottom with foil. Replace rack and spray with cooking spray. In a small bowl, whisk together remaining hoisin sauce and honey and set aside. Place pork on rack of broiling pan. Baste with hoisin/honey mixture. Roast on center rack for 10 minutes. Turn on broiler to 425°F. Broil for 10 minutes, until slightly browned. Watch carefully to be sure pork does not burn. Turn down the heat to 375°F and continue to roast for 10 minutes more. Turn pork, broil at 425°F until slightly browned, about 10 minutes. Reduce heat to 375°F and baste with hoisin/honey mixture. Repeat until surface of pork is evenly browned, and lightly glazed, about one hour total (whisk up more of the hoisin/honey mixture if needed.) Internal temperature of pork should be 140°F. Remove from oven and let rest. To serve, slice pork in 1/2- to 1-inch pieces. Drizzle with any pan juices left in the pan. Keep warm while making waffles. In a blender, combine potato, onion, egg, salt, pepper, and flour. Blend until smooth. If the mixture is too thin (you're looking for pancake batter consistency) add more flour as needed. Stir in scallions. Pour the batter into waffle iron and cook according to manufacturer’s directions until nicely browned. 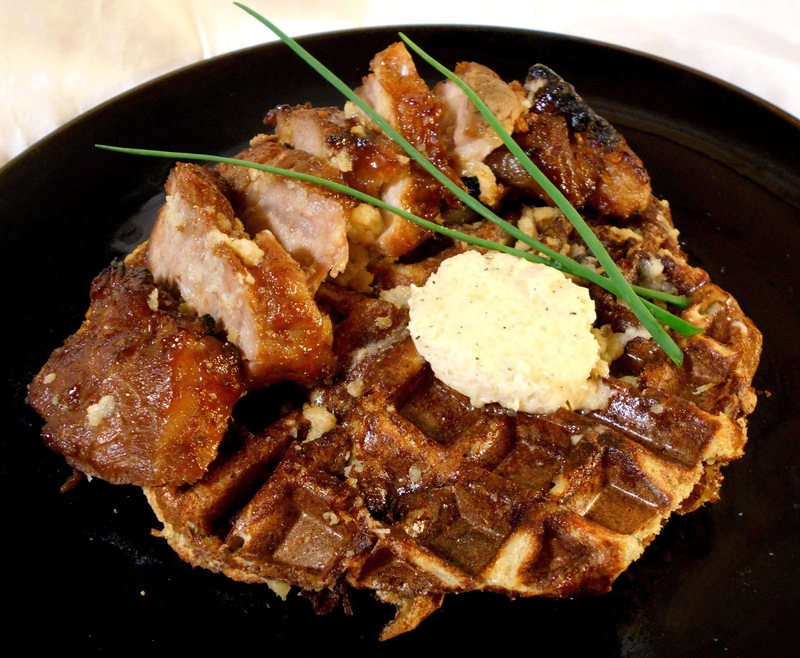 Place waffles and sliced char siu on individual plates. Top with compound butter and serve immediately. These little two bite pull-apart rolls make a great party appetizer, and the sophisticated wheat stalk appearance is much easier to create than it looks. Combine all ingredients except cheddar. Knead until the dough is and elastic and stretchy, about 5 minutes. Place dough in a lightly oiled bowl, cover with plastic wrap and let rise for about an hour, until doubled in size. Prepare two half-size baking sheets with parchment paper. Roll out each piece of dough into an approximate 10" x 14" rectangle. 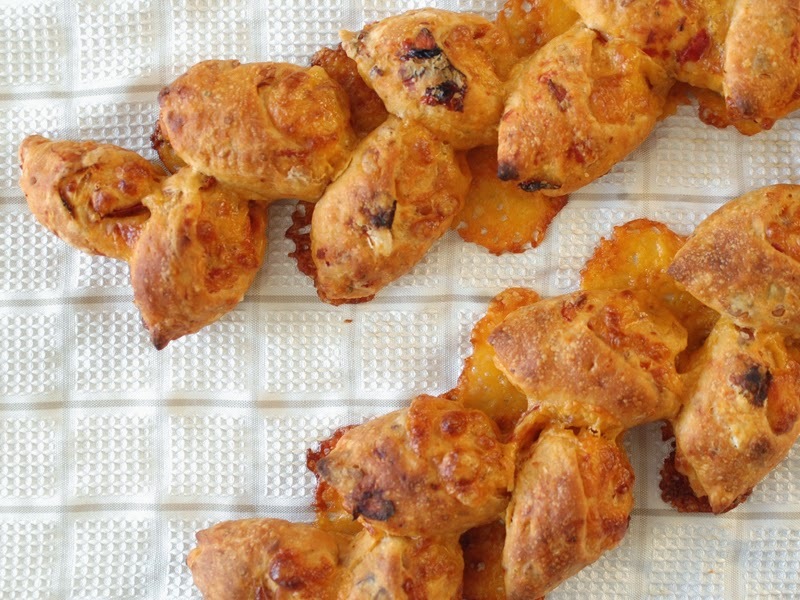 Spread the cheddar over each piece of dough, then roll up. Place each roll onto a baking sheet. Cover the baking sheets loosely with plastic wrap and let rise overnight in the fridge, or up to 24 hours. When you are ready to bake, take the pan out of the fridge and preheat the oven to 400°F. Just before placing into the oven, cut the dough at a 45 degree angle in 1 1/4" intervals with kitchen scissors, leaving the bottom 1/4" intact and laying each cut piece to each side as you go, alternating sides. Bake for 15 minutes, then let cool for 10 minutes before removing the rolls from their trays. Do you have any microbreweries near you? Chances are that you do. They seem to be sprouting up all over the place. Aside from making some amazing beer (which is a beverage that I happen to be a fan of), they are a great source for a delicious by-product: Spent grain. Spent grain is malted barley (sometimes roasted, too) that has had most of its sugars extracted for use in the fermenting process. Any brewery will likely be more than willing to give you spent grain. You'll want to get it soon after it's done being used in the brewing process. I've read that it may begin to produce off-flavors if it sits too long. Your local brewery should be able to tell you when they are brewing so you can pick some up when it’s nice and fresh. It's a shame to let this grain go to waste. It has tons of flavor left after it's steeped and can be used in cooking and baking. I finally got to try this for myself using a recipe from Donna's new book, Make Ahead Bread: 100 Recipes for Melt-in-Your-Mouth Fresh Bread Every Day, which you can buy on Amazon! I adapted her Honey-Potato Buns into slider rolls using spent grain from Wild Heaven Craft Beers, a local Atlanta brewery. To store your spent grain, put a few cups in a freezer bag, squish out the air, flatten the bag and put it in the freezer. This makes it easy to store and easy to break off a chunk when you’re ready to bake. Baking the rolls in an 8 x 8 glass baking dish makes 9 perfect slider rolls, ready to use for serving mini hamburgers or your favorite sandwich, with a beer of course! The day before you want to bake the bread, process the two ounces of thawed spent grain in a food processor until finely ground and set aside. Mix the next 6 ingredients (flour through the salt) in a medium bowl. Add the processed grain to the dry ingredients and toss to combine. Place the flour mixture in the bowl of a stand mixer. With the paddle attachment, stir in the water on low speed. Depending on the water content of your spent grain, you may need to add additional water, 1 teaspoon at a time, until the dough comes together. Switch out the dough hook for the paddle and knead on medium speed for 4 minutes. Add the butter and knead until fully incorporated into dough, about 2 more minutes. Cover bowl with plastic wrap and let stand 45 minutes. Spray an 8 x 8 glass pan with non-stick cooking spray. Turn dough out onto a lightly floured surface. Divide into 9 equal portions. Roll each into a ball and lay the balls in three rows of three, evenly spaced. Cover pan with plastic wrap and put pan into refrigerator overnight or up to 24 hours. When ready to bake, remove pan from the refrigerator and heat the oven to 350°F for one hour. Whisk egg with one teaspoon water and brush mixture over the tops of the dough balls. Bake rolls for 25 minutes. Remove from oven, let cool for 5 minutes, then remove from pan and cool completely on wire rack. Let me begin by saying that I am NOT a "Baker". I Love to get into the kitchen, mess things up, and come out with a fantabulous meal. But baking kind of scares me. It's so precise, almost an art form. And I'm not really good at it. I like to put my own spin on things, not follow a recipe word-for-word... My sweet friend and co-cook, Donna Currie, however, is a Master Baker- dare I say that she's the Bread Queen! Truly, she is! She's so awesome that she even has her own cookbook that was recently released, "Make Ahead Breads". Please check it out and if you like what you see, go ahead and order it! This book Rocks! Let me begin by saying that we (the most awesome online cooking group ever, 37 Cooks) were given a small preview of Donna's book. We were asked to choose ONE Sneak Peek recipe of hers and to play around and have some fun. I Loved this idea. So I stepped outside of my comfort zone, big time... I somehow converted "Blueberry and Cream Cheese Buns with Lemon Zest" (Donna's recipe) into "Candied Jalapeño and Pineapple- Cream Cheese Buns with a Pineapple Glaze and Bacon". And they were Wonderful. I did all of the prep work on a rainy Saturday night while watching a football game. Woke up on Sunday (we had a couple of friends stay over that night), pulled these out of the fridge, turned on the oven, and voilà! Instant Brunch. Loved that! But what I loved most about this recipe was the fact that it was very easy and also proved to be so very versatile. As I said, I don't follow directions as I should, and I like to substitute ingredients with "whatever I have on hand". This method worked so well with this bread! And I loved the "make- ahead" factor. I would actually bake a lot more bread if I knew that I could prep it the day before and simply cook it off when I needed it. So, again, please check out the book, "Make Ahead Breads". It would make a great gift for any baker, and is an awesome addition to any cook's collection! Place the candied jalapeños and crushed pineapple into a piece of cheesecloth or a strainer of any sort and allow the juices to drain for at least 2-3 hours, up to overnight. These need to be as dry (liquid-free) as possible. Combine the two egg whites with enough pineapple juice to make 1 1/4 cup, total. Place the egg and juice mixture, bread flour, brown sugar, yeast, potato flakes, dry milk, vanilla, salt, butter, and water into a stand mixer and mix (using a dough hook) until all ingredients are incorporated and the dough holds together well. You may need to add a bit more water, but do so in small amounts, as the dough should not be too wet. Cover the dough with plastic wrap and allow it to rise for 1-2 hours, until it has almost doubled. While dough is rising, combine the sugar, cream (Neufchâtel) cheese, 1 Tablespoon of pineapple juice, and lemon juice in a small bowl. Mix well (a fork will work), as it will be lumpy at first but will eventually reach a smooth consistency. Oil or grease a 9x13x 2" baking dish and set aside (I used an olive oil spray, but any cooking spray would work). When dough has risen, flour your work surface and roll out your dough. You want to make a rectangular shape, about 12x16" in size. I trimmed one long side and one short side, so that when the buns are rolled and cut, they are "pretty" on top... Once dough is rolled, spread (as evenly as possible) with the cream cheese mixture. Leave about an inch of dough (on the long, cut side) uncovered by the cheese. Sprinkle the jalapeño and crushed pineapple over the cream cheese layer. Beginning with the long, uncut side of the dough, gently roll the dough, jelly roll style, toward the cut (uncovered) end. When you are finished rolling, your dough should look like a log and is ready to be sliced. Starting at the rougher end of the log, gently slice into 12 even sized "disks" and place in the oiled baking pan. The buns will not touch one another, but that is okay. Cover the entire pan with plastic wrap and place in refrigerator overnight (or up to 24 hours). The next day (or when ready to bake the buns), remove the baking dish from the refrigerator and allow to sit out for about 30 minutes (up to an hour is okay). Preheat your oven to 350, remove the plastic wrap from the top, and bake for 40-60 minutes. Begin checking them at the 30-40 minute mark, as ovens do vary. The original recipe called for approximately 40 minutes of cooking time, but mine took about 55 minutes to cook in the center. While the buns are cooking, make your glaze. Simply combine the 1 cup of powdered sugar with the 2 Tablespoons of pineapple juice and whisk until no lumps remain. Set aside. Also prepare your crumbled bacon if you have not done so yet. When buns are cooked, remove from oven and drizzle half of the glaze evenly over the top of the entire pan. Sprinkle the crumbled bacon over the glaze, and, if desired, again drizzle the second half of the glaze over the bacon (or use all of the glaze, then finish with the bacon, if you prefer). Allow buns to cool for 10-15 minutes, then remove from pan and serve warm. Ever wonder what you're supposed to do with leftover squash or raisins? Well, thanks to Donna, here's a fantastic idea! Don't know about you, but I always have raisins sitting in my pantry, getting rock hard. I also make acorn squash a lot and always seem to have some leftover since my 5 year old eats like a bird. I've never been great at making bread. It usually comes out hard, or flat, or hard AND flat. But this bread is idiot-proof. If you're a first-timer (like myself) this is a great recipe to get started with. It's an easy-pleaser and is good to serve whenever. I served this recipe initially as a snack bread on the weekend. But, I also changed it up a bit the second round and used a large diced Gala apple instead of the squash and made it a breakfast delight. I sent it off with my husband to work and needless to say, it was gone in minutes. This is a fun and creative recipe to do with the kids. I used a bundt pan, but you can use any round, square baking pan you like. In an upright mixer, combine all dough ingredients with a dough hook. Mix on medium-low until dough is stretchy, about 5 minutes. Place dough in a large bowl greased with cooking spray. Cover with plastic wrap. Place in warm area and let rise until doubled, about 1 to 1 1/2 hours. Meanwhile, in a small bowl, blend together the coating ingredients with a fork. Coat a bundt pan with cooking spray. Separate dough into balls, about 18-24. They don't have to be even. Roll balls in the coating and drop into pan. Cover the pan with plastic wrap and place in refrigerator 12-24 hours. Remove the pan from the refrigerator, heat oven to 325°F. Place pan in heated oven, on middle rack. Cook bread about 45-50 minutes. Remove pan from the oven, and let cool a few minutes. Remove the bread and let cool another 15-20 minutes on a baking rack. *Vanilla sugar, can be bought at the grocery store. Or to simply make your own, place a vanilla bean in a mason jar, fill with sugar, cap, let sit at least 24 hours to absorb the bean flavor. 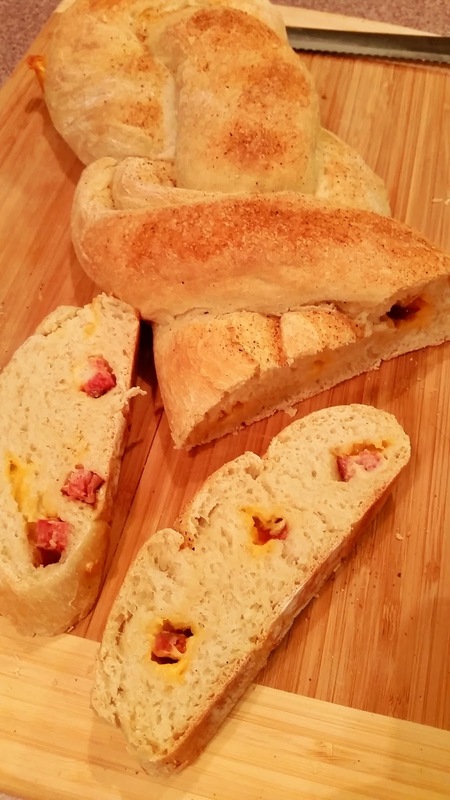 This challenge was very exciting because I got a sneak look at Donna Currie's cookbook, Make Ahead Bread, which will be released on November 4, 2014. Donna is a member of 37 Cooks, so it was fun to change up one of her recipes in her new book. I pre-ordered my copy months ago and I am anxiously awaiting its arrival. You, too, can order Make Ahead Bread: 100 Recipes for Melt-in-Your-Mouth Fresh Bread Every Day, available on Amazon. This would make a great gift for anyone who loves to bake, so you need at least two! There was substance to the texture of this bread. It was slightly chewy; it made me wish I had sandwich makings. Instead, Mark and I had to make do with two buttered slices each! My dough was so “alive” it came out of the pan in the refrigerator so be sure and use the correct size loaf pan. I could have trimmed the dough on the side, but I opted not to. It’s homemade and it has character! We were all so pleased to be invited by Donna Currie's publisher to cook from ten of her incredible recipes from her new book, Make Ahead Bread: 100 Recipes for Melt-in-Your-Mouth Fresh Bread Every Day. I was floored by the beauty of the preview we received of her book. The photography is so gorgeous, I wanted to make and eat every recipe! The best part of this book, other than the fact that all of the recipes turn out perfect every time, other than the fact that Donna is my friend and I love her and her husband Bob as if they were my own family, other than the pretty pictures, other than there are 100 bread recipes in this book is this: She breaks the recipes down so part of what you do is prep one day and then you bake the next day. This is key for me because I see bread recipes and I think wow, this recipe is too overwhelming with the instruction and the time involved, forget it. Yet, here I am having made these amazing rolls. I feel like a super star! I have a huge phobia when it comes to working with dough and yeast. I just have had a very difficult time in getting it to work right for me. I know one of the big mistakes I have made is over-working the dough. I play with it too much!! 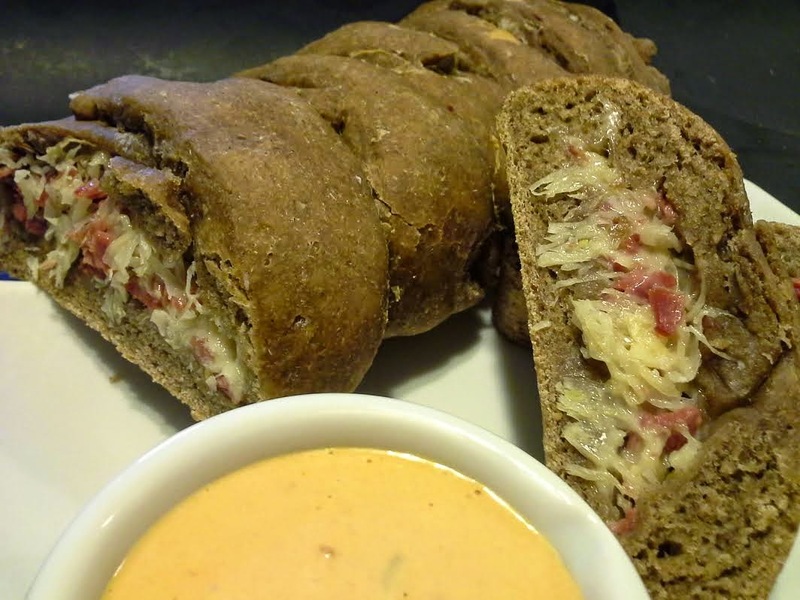 The Donna Currie Make Ahead Bread Cookbook Challenge had me sweating bullets because of my past history. I wanted to be a trooper and try something new. So, I decided to make her Whole Wheat and Parmesan Pizza Crust. To me, making bread from scratch has always seemed a daunting task. A few years ago, I learned a recipe for a rustic, artisan type loaf and I've pretty much stuck to making that bread for friends and family all year long ever since. I heard it said once or twice that baking is a science. It’s true! It IS a science, but I think it’s more like…well…magic (like nerve impulses in the human body or electricity…MAGIC.) I could not begin to explain to you how baking works, but I know a few things are very important. First, you have to accurately measure your flour (this is VERY important.) You ALSO need happy yeast. Okay, so “happy” is a stretch, but I assume they are happy when they are swimming and foaming up in a bowl of warm, sweet water. Among a few other components, a warm place for your dough to hang out for a while is also important. I know it sounds complicated, but if you trust the process you, too, can master bread making. And Make-Ahead-Bread: 100 Recipes for Melt-in-Your-Mouth Fresh Bread Every Day will set you on that glorious path of coaxing yeasted dough into crunchy, chewy vessels of warm yumminess. Make ahead bread? Really? Yes, really! Place the warm water, yeast, and sugar in a small bowl (I actually used a two-cup measuring cup for this step…works like a charm.) Use an instant read thermometer to be sure your water is at least 105˚ but not warmer than 110˚. In about 5 minutes time, the yeast will be all foamy and ready to get to work. While you’re waiting for the yeast to foam up, combine the bread flour, semolina flour, salt, and oil in a large bowl (I used a stand mixer with a dough hook.) Add the foamy, now very alive, yeast to the flour and mix on low until a dough ball forms and all of the flour has been incorporated into the dough. If you live in a humid climate like me, your dough may still be too wet (sticky.) Just sprinkle a little flour into the mixer (1 Tablespoon at a time) until the dough is no longer sticky. Turn up the speed to medium and knead the dough for 5 to 7 minutes, until the dough has a more elastic consistency. This recipe calls for you to use four mini loaf pans (5 3/4 x 3 inches.) Spray each pan really well with non-stick spray and set aside. Once the dough has doubled in size, turn it out onto a floured surface and then divide the dough into four equal blobs (or four equal parts.) Working with one piece of dough at a time, pat the piece of dough into a square equal to the length of the pan you’re using (in my case the dough needed to be roughly 5-inches square.) 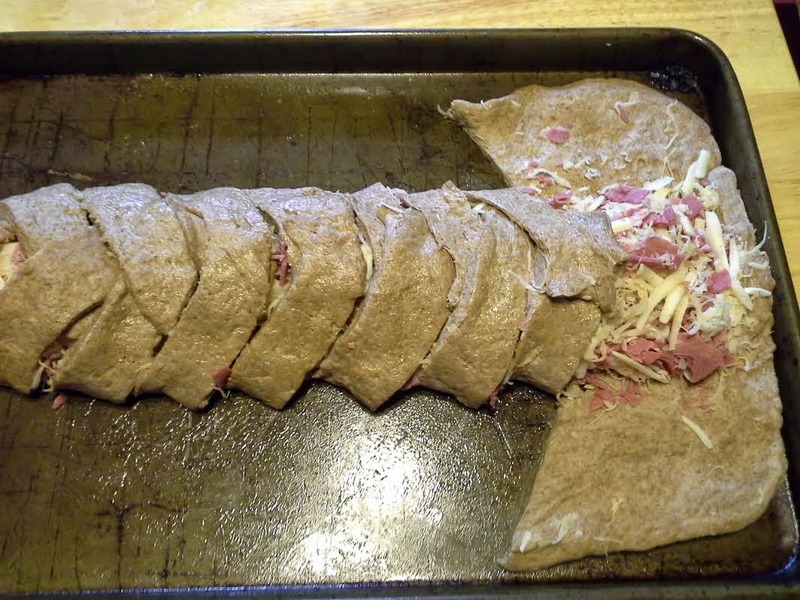 Roll up the dough into a jellyroll or cinnamon roll type log. Pinch the seam closed, as well as the ends of the log to seal it closed and place it, seam side down, in the loaf pan. Repeat with the other three pieces of dough. At this point you can cover the pans with plastic wrap (seal them in a plastic bag) and refrigerate them for 12 to 24 hours before you bake them. But, I couldn't wait that long, so I baked these the same day. Preheat the oven to 350°F. If you did refrigerate your dough, you’ll want to remove the pans from the refrigerator, take the pans out of the plastic bag and let them sit out on the counter for about 30 minutes before baking. Since I didn't refrigerate my dough, I gave the dough another 15 minutes to rise a little more while the oven was heating up. Combine the remaining sesame seeds and poppy seeds with the garlic granules and onion flakes in a small bowl. 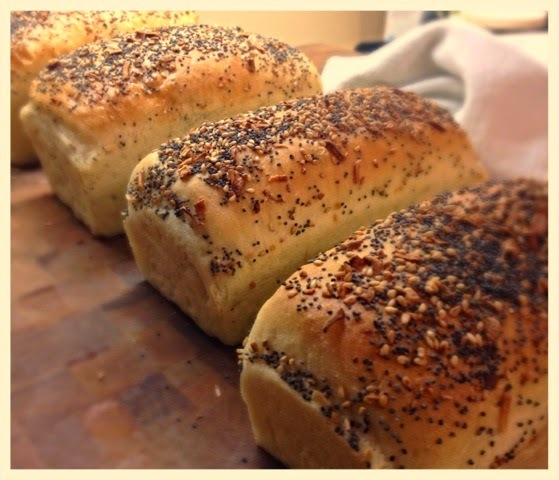 Brush each loaf with egg wash and sprinkle each loaf generously with the seeds, garlic and onion. If you are using pans that are close to 5 3/4 x 3 inches, bake the bread for about 20 to 30 minutes. The internal temperature of the loaf should read 195°F on an instant read thermometer. Remove the loaves from their pans and cool them on a rack before you slice into them. In our home, family time is spent in the kitchen or outside at the grill talking, laughing and creating delicious meals together. That's where Donna Currie's Make Ahead Bread book comes in. It's full of amazing recipes that are delicious, healthy and easy to prepare. Not to mention the photography is gorgeous, too! 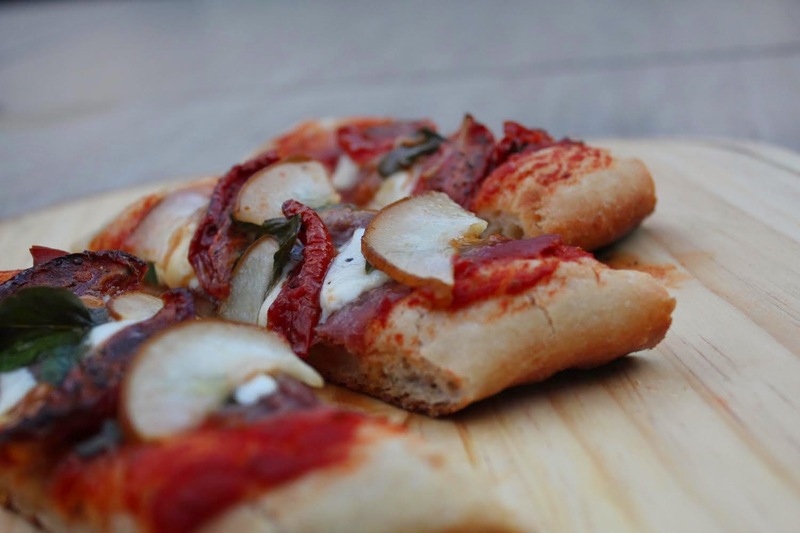 Share these recipes with your family and friends and see their smiles when they take their first bite of freshly baked bread from the oven, or in our case freshly baked pizza off the grill. Donna's Whole Wheat Parmesan Pizza Crust is the perfect crust. So quick and easy to make with just the right amount of crispiness on the outside and a perfectly chewy texture on the inside. Oh yeah, and it tastes amazing! In the winter months, I am always ready to do my “snow dance”. Unlike most folks who live in the northeast area of the USA, I was thrilled with the amount of snowfall we received last winter! I am hoping for a repeat this year. If the winter weather keeps us home, we avoid cabin fever by making all of our favorite comfort foods. When fellow 37 Cooks member Donna Currie published her new cookbook, Make Ahead Bread: 100 Recipes for Melt-In-Your-Mouth Fresh Bread Every Day, I was immediately drawn to her compound butter recipe. Everyone knows I am not one to bake, but as we all know, everything is better with butter! I loved the idea of using apple in the compound butter, so I honor Donna by keeping apple as the star ingredient. Then I went into high gear figuring out how I would put my personal spin on her recipe. Apples led to brown sugar, then cinnamon, and then everything else you would want melting over hot fluffy pancakes! Thank you, Donna, for the inspiration!! Wishing you much success with this amazing, beautifully written and photographed work of taste/art!! In a medium-sized covered bowl, allow the butter to soften, about 6-8 hours. Bring the mascarpone to room temperature at this point. Preheat the oven to 350°F. Spread the pecans on a small baking sheet in a single layer and roast for about 10-12 minutes. Time will vary depending on your oven. Set aside. Heat 1Tablespoon of butter in a skillet over medium heat. Add the apple, brown sugar, cinnamon and salt. Sauté until the apples just start to become tender and very fragrant, approximately 7-9 minutes. Transfer the apples to a plate and allow them to cool. 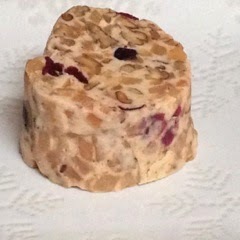 Using a large whisk, combine the orange zest, dried cranberries/Craisins, apples and pecans with the softened butter and mascarpone. Take a large piece of plastic wrap and scrape the compound in the middle. Fold all ends and roll the compound butter into a log. My personal favorite method is to fold the sides over and “spin” the butter with the ends to create a log of butter. I tie the ends and refrigerate until it sets. Most folks have a go-to recipe for pancakes. I like to take the butter out of the refrigerator at least 30 minutes before making pancakes. 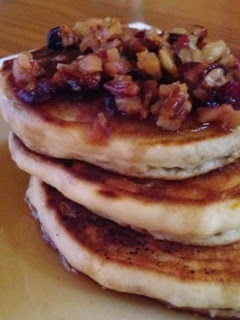 Allow the butter to melt over the hot pancakes and drizzle with a good quality maple syrup. I am serving my pancakes with a locally sourced sage sausage. Sage. Another nod to Donna. I am so very proud of her new cookbook! Getting a cookbook published is like riding a roller coaster. It's all ups and downs, with short sections to catch one's breath every once in a while. And then work-work-work-work to get to the top of the next hill. At the very beginning, before the ride even starts, there's a bit of euphoria at the glimmer of hope that there's enough of an idea to even begin writing the proposal. Because you can't just approach publishers and say, "I gonna right gud fud recipez 4 U." No, you need a reason why people will buy the book. And unless you're already a household name, that means a good theme. A hook. A reason for people to pull out a credit card and click a button. What a pleasure it was to recreate a recipe from a friend's new cookbook, "Make Ahead Bread" by Donna Currie. Donna is an amazing bread wizard and for me to recreate something from her cookbook is overwhelming. Thankfully, we were allowed wiggle room. I loved doing it and I hope you will try this recipe. It turned out terrific and can be done up to two days in advance. I wholeheartedly recommend this cookbook to everyone!!! In a medium bowl layer each ingredient, ending with the yeast. Combine well. When it is combined, pour out onto a floured surface. Knead until it is very stretchy and elastic. Place back into bowl and let it rest in a warm space for about an hour. Rye bread takes a bit longer to rise. When it has risen, place some plastic wrap over the top and place it in the refrigerator until you need it. I just chopped and grated into a bowl and mixed it together. If you want to layer it in there, that would be terrific also. about 5 minutes. I rolled into a log shape. I sliced down the middle and then sliced about a quarter of an inch into both sides. I then peeled the sides back. I put the filling into the middle of the bread, pressing down lightly. I then cut slits into the side flaps and folded over the top. I did close off each end. Bake at 325°F for about 30 minutes. Brush with butter about 5 minutes before taking it out. Serve with a side of 1000 Island dressing. A great meal for a hungry group! Please go and get this book. You will never need another one! I love bread and I have never attempted to make bread. When this challenge came to us, I was thrilled! I decided to take a chance and try to bake this braided bread. I used the white bread recipe for this challenge. I figured that I could spice it up a bit with some seasoning, cheese, and smoked sausage. This recipe did not disappoint my taste buds. Prepare the dough the day before baking. You will need to prepare the dough 3 separate times in 3 separate bowls, one for each rope. Mix all ingredients for dough in medium bowls, then knead each by hand. Once dough has been kneaded place dough back into medium bowls, cover and set aside in a warm place for 45 minutes to rise. While bread is rising, brown sausage in a skillet for 20 minutes, until cooked. Remove from skillet to cool. After the dough has risen, place a sheet of wax paper on a baking pan and lightly coat with flour. Remove each dough from bowl and form into 3 ropes, each roughly 20 inches long. Place each rope on the baking pan. Using a paring knife, butterfly each rope and place diced sausage and cheese into the dough. Once everything is placed into the dough, close the dough so that no ingredients fall out. Line up each piece of dough next to each other. Pinch the three together at one end, then braid loosely. After each piece of dough is braided, pinch the other end together and fold the pinched ends under the dough. Cover with plastic wrap and refrigerate overnight, or up to 24 hours. After 24 hours or less, remove the dough from the refrigerator and remove plastic wrap. Add spices to the top of the bread. Preheat oven at 350°F. Place dough in the oven for 25 minutes, or until the bread is browned. Remove bread from oven and from pan to cool. Add remaining 2 Tablespoons olive oil to top of bread. 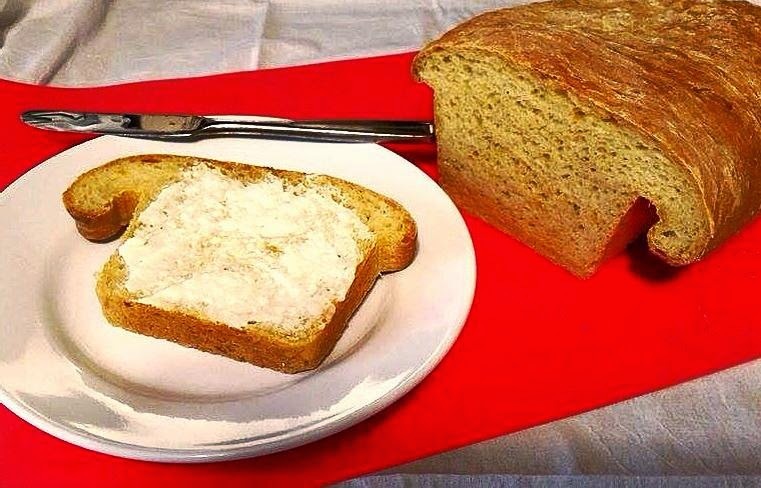 Serve bread once it has cooled. Wow! 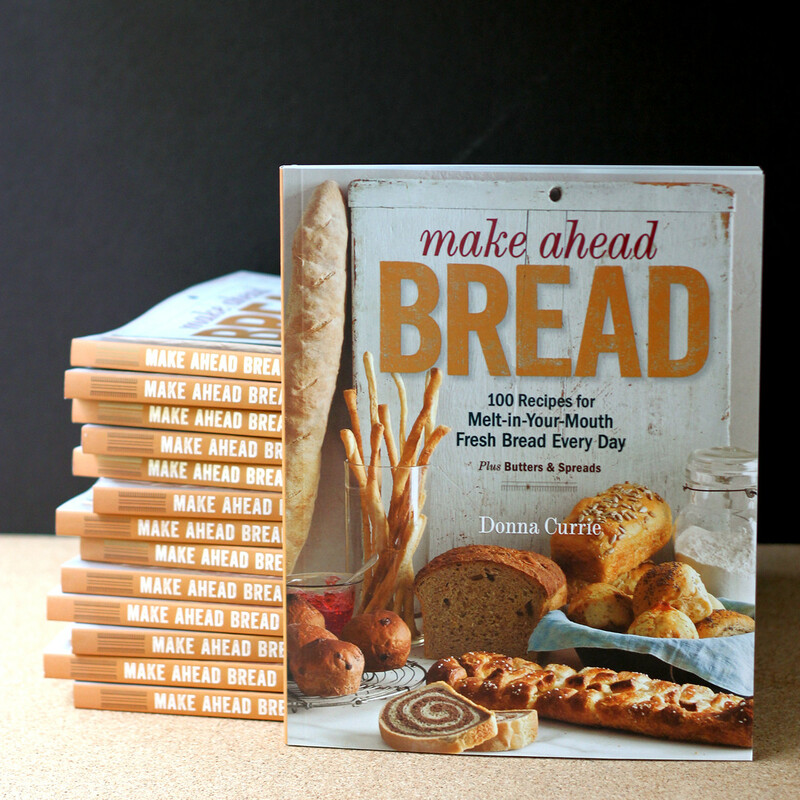 I am so excited about Donna Currie’s new book, Make Ahead Bread. I have the good fortune of being a 37 Cook along with Donna. I feel that I can call her my friend, even though we have never actually met in person. She lives in Colorado and I am in Virginia. I do chat with her quite often about matters in 37 Cooks and we are also members of Cook My Book (a group that shares cookbooks and reviews recipes) together. I frequently ask her advice on baking and bread making, because it has never been one of my strong suits. However, with her new book, I feel like I can make fabulous bread too! The directions are straightforward and easy for cooks and bakers of all levels. The photographs are absolutely beautiful. I strongly recommend this book for the seasoned bread maker or beginner. 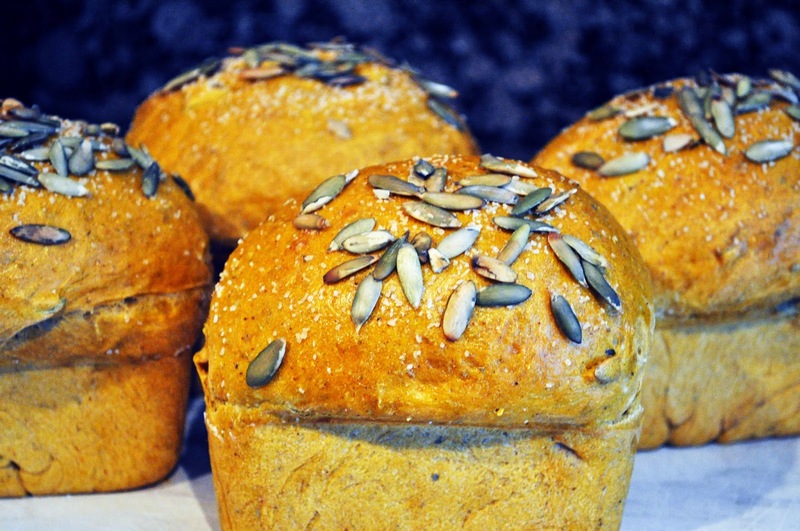 This recipe was inspired by her Mini Sunflower Seed Loaves. I love sunflower seeds! Since the challenge was to use her recipe as a base and change it up, I went with pepitas (shelled pumpkin seeds) and a few other ingredients to add some complimentary flavors. Her directions are for making it ahead of time. I chose to make mine all in the same day. You can alternate her recipe and my directions for either kind of loaf and get good results. Her version does not require a stand-up mixer and you knead the dough by hand. On the second rise of the loaves, you can cover them in plastic wrap (instead of a kitchen towel) and place them in the refrigerator overnight for baking the next day. When I was making my version, I asked Donna how long it needed to rise on the second rise if I was not making it ahead. She gave me a great tip about the readiness of the dough. Here is her response: “Half the time of the first rise, usually. So if it doubles in an hour, second rise is usually 30 minutes. Poke it lightly with your finger, and if it bounces back, it can rise longer. If it leaves a little dent, it's ready.” Thanks Donna! In a large mixing bowl of a stand up mixer, combine the water and yeast. Let stand for 10 minutes. Add the flours, chili powder, cumin, oregano, olive oil, pumpkin, 1 teaspoon kosher salt and 1/2 cup of the pepitas. Mix with paddle until ingredients are incorporated. Switch to a dough hook, and knead the dough on medium for about 10 minutes, until the dough is smooth and elastic. Keep an eye on the dough and if it is too wet, add more bread flour, 1/4 cup at a time, to get the desired result. Shape the dough into a ball and place in an oiled bowl. Cover with plastic wrap and let rise for 1 hour. The dough should be doubled in size at this point. Take the dough and divide it into 4 equal pieces. Roll each dough into a ball and place them into a lightly oiled 4-cup mini loaf pan. Cover with a clean kitchen towel and let rise for an additional 30 minutes. Lightly brush the loaves with the egg/water mixture (discard the remaining mixture.) Sprinkle the loaves with remaining teaspoon of kosher salt and 1/4 cup pepitas. Preheat oven to 350°F. Bake the loaves for 25-30 minutes, or until they reach an internal temperature of 195°F. Gently take the loaves out of the pan and let them cool completely. Slice and serve with butter or Donna’s recipe for Chive Cream Cheese. How wonderful that we have one of our own cooks, a newly published author, offering the current challenge! Donna Currie has been one of our cooks since day one. In fact, if my memory serves me correctly, it was Donna who first suggested the name "37 Cooks" for our group! She is not only a member, but she has recently taken over management of the group, a post she is not only more than qualified for, but one in which she will undoubtedly thrive, as will the group. Donna's book is called Make Ahead Bread, 100 Recipes for Melt-in-Your-Mouth Fresh Bread Every Day. The challenge given to our group by Donna's publisher was to choose from among several recipes that were released to us in advance of the book's publishing date. Each cook that accepted the challenge made the recipe of their choosing with his or her own unique twist. We had a blast, as you will see in the coming days! Not only is the book is beautifully photographed, the format of the recipes is a real time saver, allowing the cook to make part of the recipe one day, and the rest another day. For cooks who question their ability to bake bread or other recipes containing yeast, this step-by-step approach, broken up over 1-3 days, is a real lifesaver. Having followed Donna's work on her blog, Cookistry, and her articles on Serious Eats and many other publications online and in print, we all knew we'd love the book. But, we just didn't know how much we would love it! You will too! This dish can be served as a “Bowl O’ Green” or as soft tacos or over rice. I love it as a sauce for Huevos Rancheros with soft tortillas, black beans and poached eggs. Don't forget the jack cheese! 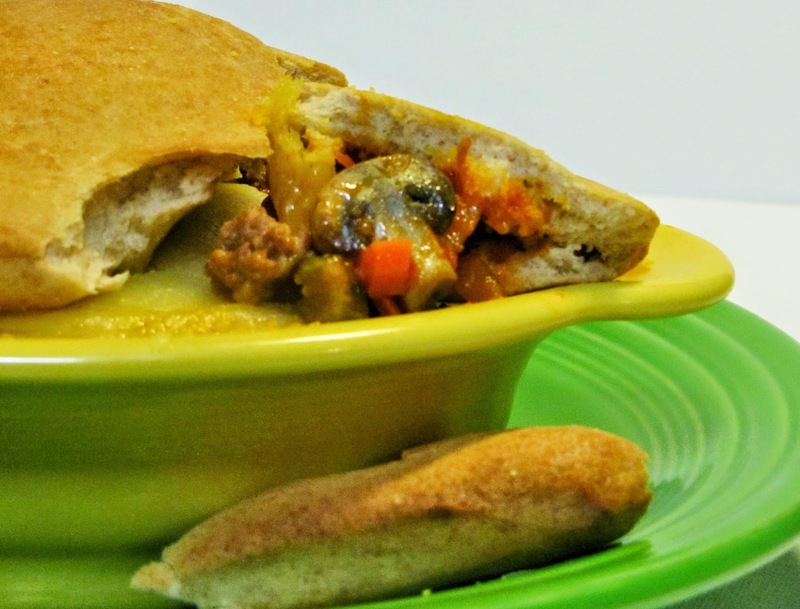 It’s very versatile and perfect for a chilly day – also great for those Football Sundays with a crowd! 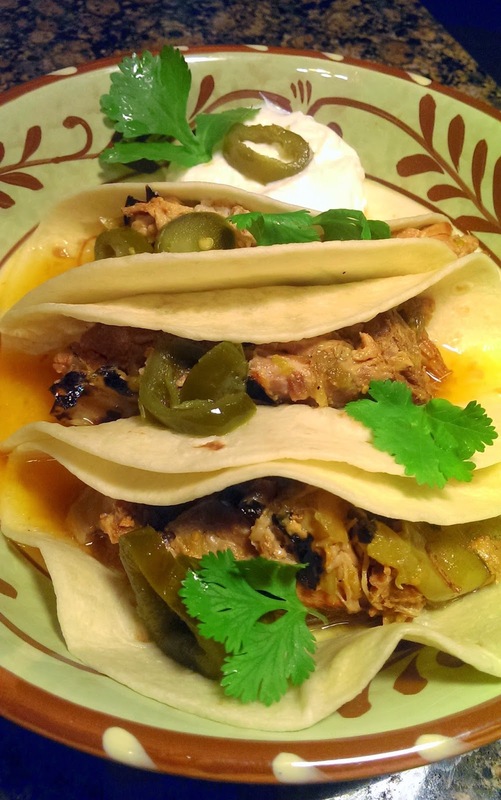 The ingredient list is short, because Hatch chiles and pork are the stars. Roast the chiles either on a grill, gas stovetop or oven broiler until the skins are black. Place the chiles in a large bowl covered with plastic and allow to steam 10 minutes. Peel off the charred skin. Cut off tops of chiles, discarding seeds. Split chiles and with the back of a knife, remove any seeds and ribs. Cut chiles into 2” pieces and set aside. Quarter tomatillos and place in slow cooker sprayed with vegetable spray. Add the boneless pork (if using boneless country ribs, they can be placed whole in the Hamilton Beach Set 'n Forget 6-Quart Oval Programmable Slow Cooker; if using shoulder, cut the pork into chunks.) Sprinkle with salt, pepper and cumin. Add roasted chiles to the slow cooker. Cook on HIGH 1 hour, stir; then cook on LOW 8 hours.